Comsewogue hosted one of the most epic environments for a regular season lacrosse game. The student section was roaring with :40 minutes prior to the coin toss. Comsewogue students were hooting, hollering, and looking to get inside the heads of the Mt. Sinai Mustangs. The crowd for the Stangs was equally as rowdy. Fans traveled crosstown to witness their boys earn bragging rights over rival, Comsewogue. In the first quarter, Comsewogue executed their game-plan perfectly: limit transition goals, don’t lose face-offs clean, and make it a 6v6 game. At the end of the first, the score was Sinai 1 and Wogue 0. However, in the second, the Stangs started to open up the scoreboard. The spark came from freshman phenom, Joey Spallina. Playing a half-field possession against Comsewogue’s dynamic zone defense, Spallina popped the crease, caught a pass at the top of the box, and hit Brandon Ventorola on a backdoor cut. Ventorola stuck the shot and Sinai’s student section erupted. At this point, Spallina was just getting started. During the next possession, Spallina popped the crease and caught a pass near the top of the restraining box. This time, Spallina recognized nobody on his hands. So, he stepped down, sized up the goal, and placed a perfect shot off the hip of Tommy Heller. After that goal, Spallina turned the Stangs Student Section, lifted his arms, and made sure they were entertained. From that point forward, the Sinai students had a lot to cheer about. Bobby Demeo proved he isn’t afraid of the big moment after two big goals, one coming from a shot up the hash marks and one after a full-field transition opportunity. The seventh goal for Sinai came when Russ Maher got underneath his man, got pushed into the crease, and got leveled by a sliding defender at the same time. At the half, the score read Sinai 7, Wogue 2. In the third quarter, Russell Maher started hitting his stride, capitalizing on the momentum he created late in the first half. In one possession, Maher had 4 shots on goal, finally cashing on the fourth. Tommy Heller was doing everything he could to keep the Warriors in the game. However, Sinai had too many possessions, too much fire-power, and too many guys who can fill up the cage. During the final twelve minutes, Sinai locked it down on defense, giving up nothing. On offense, the Stangs scored their final goal with about 10:00 minutes remaining. Russ Maher made a move top side and rang one off the far pip and in. The rest of the game, Sinai demonstrated their skill, IQ, and awareness by playing an impressive game of keep-away. This team is very good, they are just young. Most of the Warriors top contributors are just sophomores. On defense, sophomores Aidan McCaffrey and Brendan McCrary are absolute studs. On offense, Corey Watson at the midfield and Jake Deacy at attack, are legit players who will continue to grow as they gain valuable game experience. Another key contributor is Senior, TJ Heyder. Heyder is a slick, skilled south-paw who can score goals. In net, Tommy Heller is a GOAT. He continues to make big time stops and make saves he isn’t supposed to make. With Sinai dominating the face-off X, Wogue wasn’t able to stick to their game plan and their defense grew tired. Karl Lacalandra is an animal, but didn’t look 100% out there. Sean Kennedy is some athlete who can really give the Warriors a chance to play fast. Coach Mitchell always has a good gameplan and it’s apparent his Warriors will continue to compete for a County Title in Class B. However, last night they ran into one of the best teams on Long Island. This team is so good. From the defense, through the midfield, into the attack, Sinai has studs. The defense, led by Senior captain, Mike Sabella, is so steady. 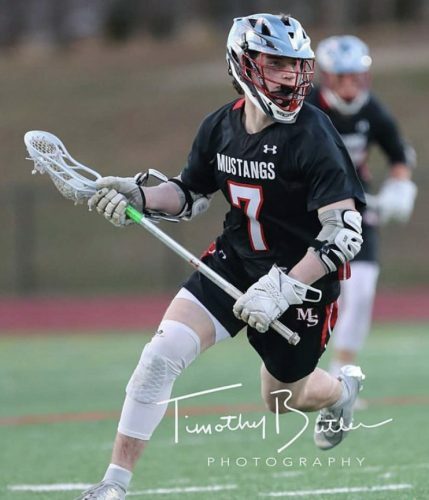 They can play a high pressure man, they can mix it up with their traditional zone, or they can just not play defense at all because they have a rising star at the face-off X. Kevin Sweeney, junior face-off specialist, was 14/17 on the night. He was a big reason Sinai was able to take control of this game. After the game, Sweeney credits his two stud wings in Mike Sabella and Jack Schirtzer. However, Sweeney can definitely win draws on his own thru pure speed, quickness, and grit. Schirtzer was a big edition to this team because of his ability to cause turnovers in the middle of the field. Jack had two big takeaways in this game that resulted in goals at the other end. On offense, this doesn’t look like a good High School team, they look like a good College team. The Stangs move the ball so quick, so accurately, and so deliberately. The three-headed monster on attack includes freshman Joey Spallina, junior Russ Maher, and senior Bobby Demeo. On the midfield, Sinai leans on super sophomores Tyler Gatz & Brandon Ventorola. These two kids can flat-out play the game. Senior captain, Dominic Boscarino rounds out this complete midfield unit. Those six players, when healthy and all playing together, might be the most unstoppable offensive unit on Long Island. With Spallina’s skill, IQ, and riding ability + Maher’s athleticism and attack everything mentality + Demeo’s slick off-ball play and ability to score + Gatz’s speed and poise up top + Venterolas energy and firepower + Dom’s leadership and experience, the Stangs are an absolute bear to guard. If you love this game, do yourself a favor, get out the door and go watch the Stangs.